With skin cancer on the rise, it’s more important now than ever to get smart when it comes to sunscreen. Protect yourself by checking out these common mistakes that you may be making with your sunscreen. It’s true. Vitamin D is essential as it absorbs calcium and promotes bone growth. But you can get a sufficient amount of Vitamin D by spending only 10-15 minutes in the sun. It’s not worth foregoing sunscreen, as most people don’t apply enough to prevent the production of Vitamin D anyway. One application in the morning isn’t going to last you throughout the entire day. If you are swimming, playing sports, or spending the day out in the sun, then your sunscreen should be reapplied approximately every two hours. While people with more pigment in their skin do have a lower risk of getting skin cancer, they are not completely immune. As a matter of fact, skin cancer can be even more dangerous for those with darker skin as it’s often diagnosed in the later stages. A tan is your body’s reaction to UV exposure. It’s a sign that damage has already been done, and this does not protect your skin from further damage. Many people only apply sunscreen to their face in order to protect it from premature aging. While this is a good habit, the truth is that you can develop skin cancer anywhere the sun touches. Don’t forget your neck, hands, legs and feet — not only for the sake of protecting your skin from cancer, but protecting those areas from premature aging as well. 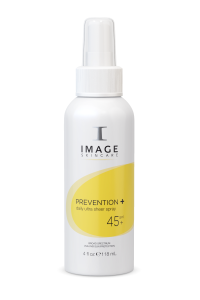 You can use the Prevention+ Ultra Sheer Spray SPF 45 to quickly, and effectively, cover the other exposed areas. While windows do block the more intense UV rays, it still allows enough rays to pass through to cause damage. You can easily swap your everyday moisturizer with the Prevention + Daily Hydrating Moisturizer that has an SPF of 30.